Last week’s episode, The Lost Commanders, was mostly spent setting up conflicts for the second season of Rebels. It was a bit light on action but measured in its pace. It took time to let the characters simply exist in their situation. The same cannot be said for the second episode the season. Relics of the Old Republic hit the ground running and didn’t so much as stop to breathe. There are spoilers for the episode below. Relics of the Old Republic kicks off with the Empire coming for the clones, having been alerted by Wolffe that Jedi are on Seelos. The episode played out like a submarine movie or Wrath of Khan (which is, to be fair, just a submarine movie in space) but with tanks instead. 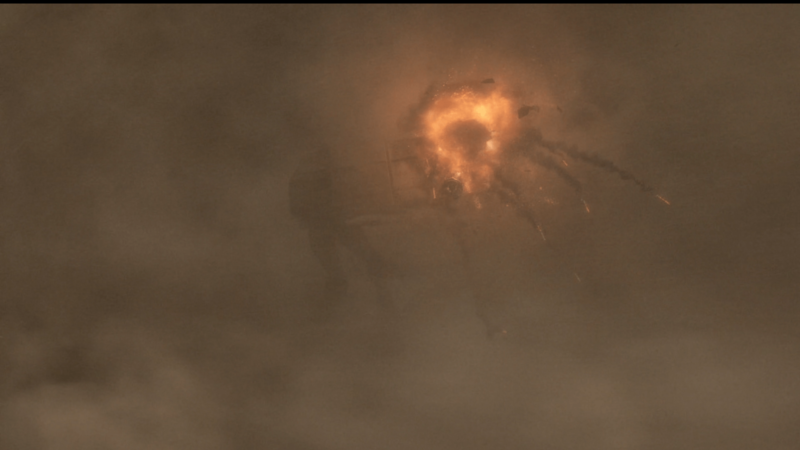 Having the blinding environment be a sandstorm was a welcome twist on the old trope, as well as being a visual treat. Like any good submarine story, the commanders are thinking several moves ahead and anticipating their opponent’s moves. It’s pure strategy. A thinker’s battle. You need a single, decisive strike. In many ways, it’s a cinematic samurai duel. It’s one of the few battle sequences in Rebels so far that feels like it would fit in a war film. Seeing the clones, older and paunchier but no less vital, tackle the Empire head-on is a joy. “I hope you brought a better class of soldier than those stormtroopers,” Rex sneers at Agent Kallus. Dave Filoni has said a few times that the clones are definitely better soldiers than stormtroopers – they’re a class above with better training, discipline, and genetics. Relics shows us just how much better they are – the clones take on a numerically and technologically superior foe and give a good accounting of themselves. The exchange between Rex and Kallus also reveals much of the Imperial military’s view on soldiers when Kallus replies, “They serve the Empire well and I have a great many of them.” The Empire is heartless and cruel. Individuality is suppressed in the service of the greater military. The clones’ tactics help level the playing field, though it’s not enough. They are at their best when a Jedi is there to lead them. The clone army could hold the line better than any other army in galactic history but the Jedi gives them the crucial edge. Amidst the sandstorm, it’s the combination of clone tactics and training with the Jedi’s ability to use the Force that makes the difference. Later, when the clones knowingly make what will be a futile last stand the tide only turns once Kanan and Ezra return. It’s clear that the Jedi and clones are better when working together. It will be interesting to see that dynamic explored throughout the season. Visually, the episode has a few surprises. 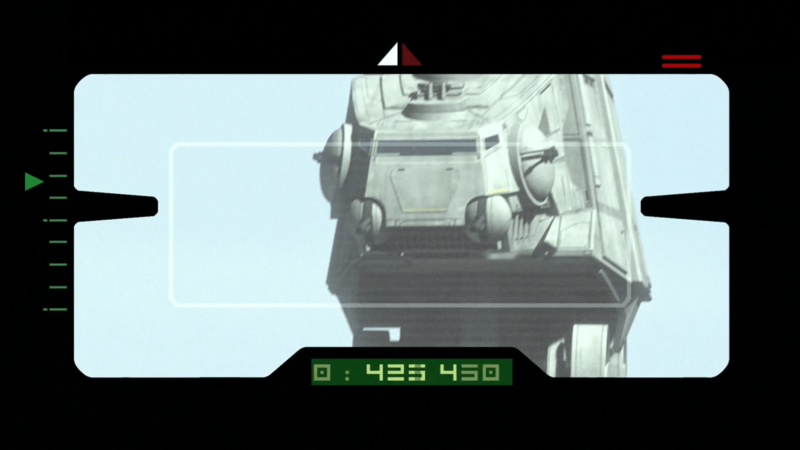 The introduction of the AT-AT into Rebels references both The Empire Strikes Back and Ralph McQuarrie’s concept art. The walkers are taller here than on Hoth, with a few other differences. In effect, it’s a different model year of AT-AT. The storm was incredibly animated – it had a density and ferociousness to it that was almost tangible. It’s hard to imagine a better backdrop for AT-ATs as they march across the salt flats. 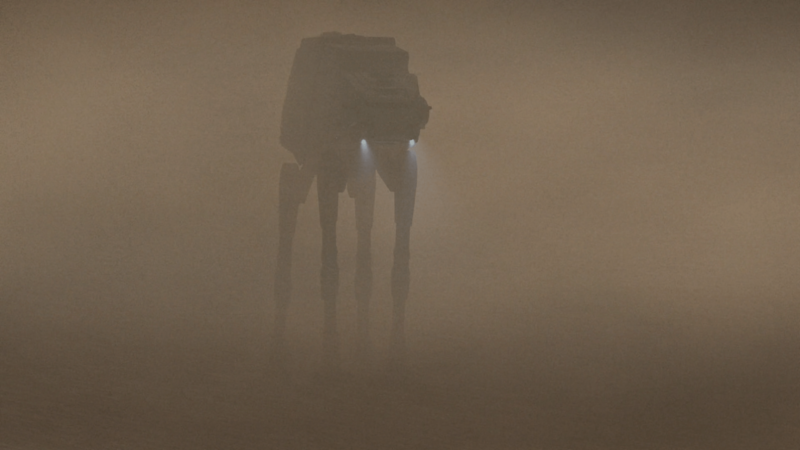 ‘Walker in a Sandstorm’ a modern painting. When the clones’ AT-TE ‘tackles’ the AT-AT and struggles to hold the line, you can’t help but cheer for the clones. It’s hopeless. They’re outnumbered and outgunned but they’ll not go down without a fight. That shot paints them as the underdogs and it looks much like a corgi trying to knock over a Great Dane. Fitting metaphor for the rebels, that. The clones are given some good moments in this episode. Rex is the consummate old soldier. He’s prideful, confident, and stolid. When they first see the trio of Imperial walkers, Rex takes a fascination with their design, noting with interest the various bits of armor and weaponry. It’s a nice touch for Rex to be a bit of a gear buff, like a WWII fanatic. Gregor, though a bit off his rocker, is still a formidable fighter and soldier in his own right. Wolffe is a bit of a wild card. He doesn’t have strange mannerisms like Gregor but I think he’s actually the one hurting the most from the war. When they march into battle, Wolffe lets out an animalistic howl of a battle cry. Ezra continues to step up as a leader. He seems to be acting as the group’s moral compass, which is a huge change from his introduction in Spark of Rebellion. In The Lost Commanders he’s the only rebel to keep a cool head and be diplomatic. In Relics he’s the one who convinces the crew to turn around when the clones make their doomed last stand. This is an interesting space for the character to occupy. He’s the youngest of the rebels and the newest to join the crew. Zeb isn’t given much to work with in this episode, aside from a few bonding moments with the clones, so we don’t see much growth from him. Sabine also plays a support role, backing up Ezra on the cannon and fixing the Phantom. I guess it’s to be expected that these characters get less screen time in an episode that is focused on Jedi and clones. In Space No One Can Hear You Get Left Behind. 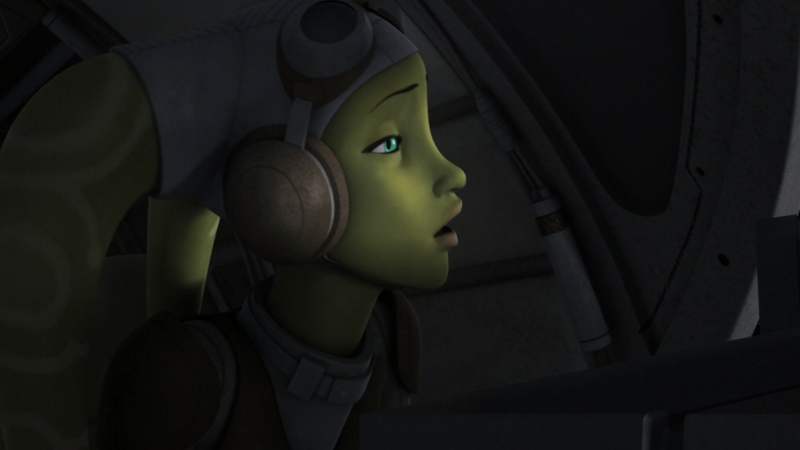 Most frustratingly, Hera is sidelined again. She spends the episode aboard the Ghost making repairs. Her most significant action in the entire episode is shutting down power to the ship. It’s frustrating to see her sit out so much of the action. She’s the general of this little band of rebels – the one who calls the shots and gets the jobs. She’s an action hero in her own right. 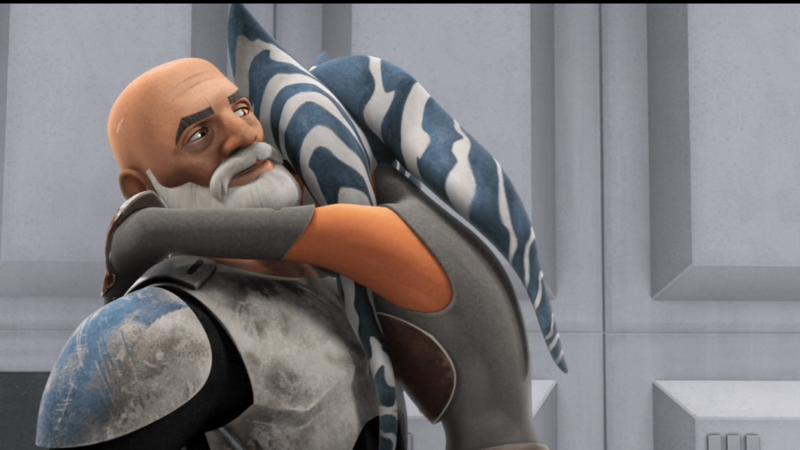 The emotional high point of the episode is definitely when Rex and Ahsoka are reunited. 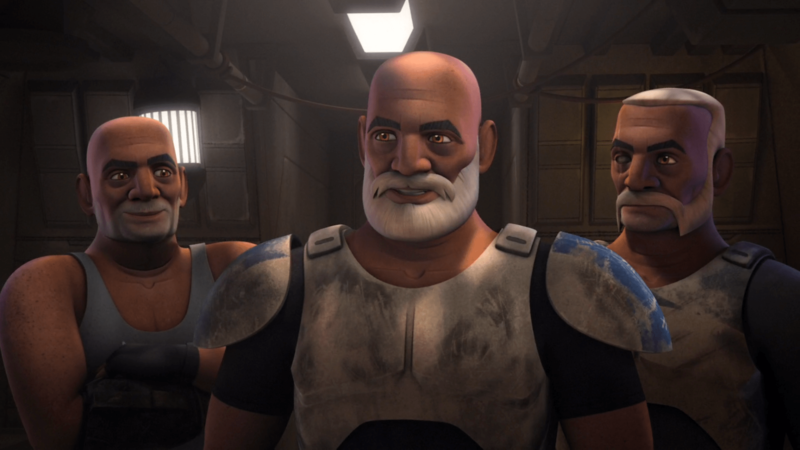 Seeing these characters together again after the vagaries of their fates in Clone Wars is quite something. Brings a tear to my eye every damn time. Relics of the Old Republic is a solid episode. I give it 3 stars out of five. 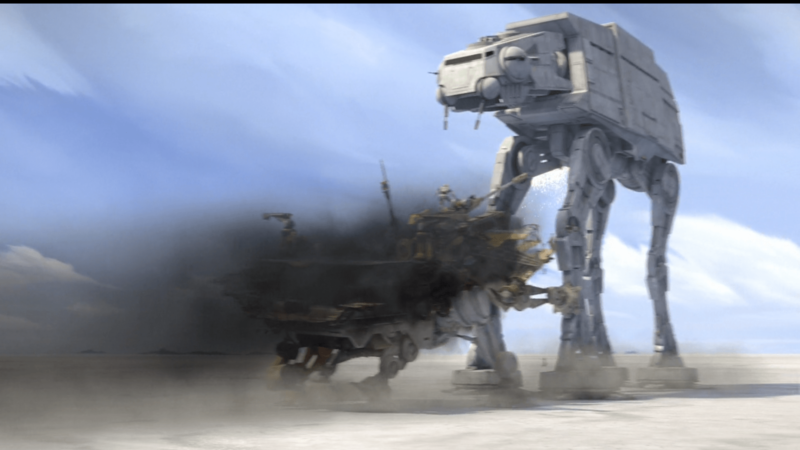 An AT-AT battle was pure nostalgia. While I enjoyed it, I’m not the biggest fan of nostalgia. I’d rather the show do new and interesting things. This entry was posted in Rebels in Review, Reviews, Star Wars. Bookmark the permalink.